The South Asian Legal Clinic of Ontario (SALCO) and the Metropolitan Action Committee on Violence Against Women and Children (METRAC) are deeply disappointed by the recent passage of Bill 62 in Quebec, which perpetuates gender and religious discrimination against Muslim women who wear a face covering. Bill 62 will potentially increase the vulnerability of women who may be facing abuse or violence at home, by limiting their ability to seek services and supports. It will also potentially exclude them from receiving public services, thereby increasing their risks to health and safety threats. Bill 62 claims to foster “religious neutrality”, by requiring Quebecers to provide and receive public services with their faces uncovered. Although the legislation does not mention any particular group, it will have a direct impact on the religious freedom of the few Muslim women who wear the niqab or face covering, while they are taking part in ordinary aspects of public life in the province. SALCO is a legal clinic that serves low income South Asians in Ontario. METRAC is a community-based organization that provides support and information to women affected by violence. As a legal and women’s anti-violence service provider, SALCO knows that this Bill will severely impact the everyday lives of Muslim women. We routinely observe the numerous barriers these women face in accessing justice and other basic needs such as healthcare, employment, education, and safety, due to poverty, language barriers, fear about their immigration status, and complex legal and social systems. METRAC works to counter the effects of marginalization and violence on women and youth from diverse backgrounds, including those of multiple faiths, genders, races, and ethnicities. 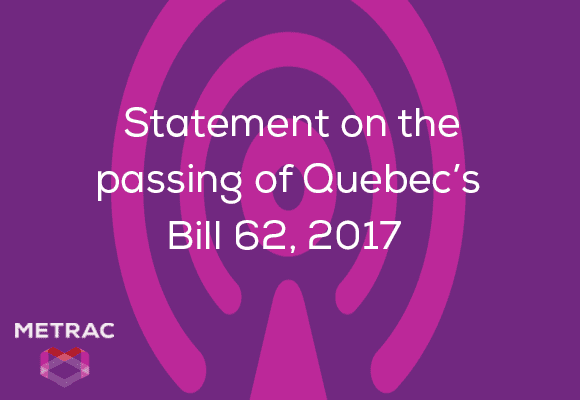 SALCO and METRAC are concerned that Bill 62 will force already marginalized women who wear a niqab to choose between receiving services offered to everyone, and living according to their religious beliefs. We believe this law is an affront to the Charter of Rights and Freedom’s protection of religious freedom, and an assault on the right to dignity and equality. In addition, we fear Bill 62 will have a severe impact on women’s safety. For some Muslim women, wearing the face covering is both an expression of spirituality, and a means to facilitate their participation in the public sphere. Legislation that expressly dictates women’s attire will push these Muslim women out of the public sphere, depriving them of equal opportunity to employment, education, legal and other services. This will increase the vulnerability of women who may be facing abuse or violence at home, by limiting their ability to reach out. In addition, the everyday practical implications of the law are very real and terrifying: will a woman in a niqab be able to get care at a hospital? Will she be rejected in provincial offices that provide social assistance or legal aid services? Will she be barred from taking a bus or subway at night and in the winter? Further, when a law sends the message that women in a niqab are less worthy and should be excluded from public life, that message may extend to a general public perception that it is acceptable to shun, harass, or even threaten the safety of these women. With exposure to increasing harassment, women may experience higher levels of fear, anxiety and stress. The title of the Bill suggests the possibility of accommodation on religious grounds. We ask, how must a woman ask for accommodation, how will it be granted, and by whom? It is our experience that requiring an already marginalized person to ask for accommodation is a barrier itself and unhelpful. Bill 62 does not have a neutral effect. Those who do not wear a niqab will continue to enjoy full public participation, but women who wear the niqab will be excluded. SALCO along with METRAC and other partner organizations and allies strongly oppose Bill 62. We stand together to uphold the safety, equality and human rights of Muslim women across Canada.